Walking around near the International Mall in Tampa, Florida I took a few photos of this building because I especially liked the landscaping with the palm trees around the structure. A man came out and wanted to know what I was doing. I told him I liked the building and he said he was the owner and left when he determined I was somehow not a threat. 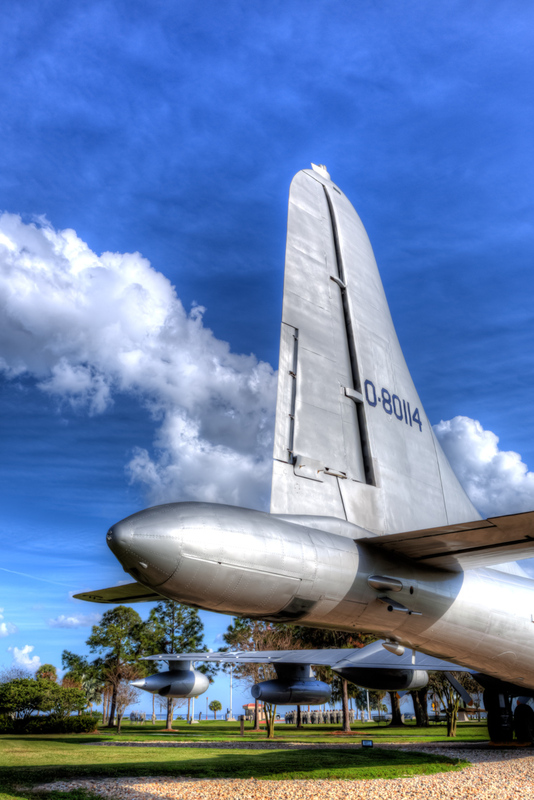 This B-29 Bomber is mothballed and placed on display in a public park at MacDill Air Force Base in Tampa/ St Pete, Florida. 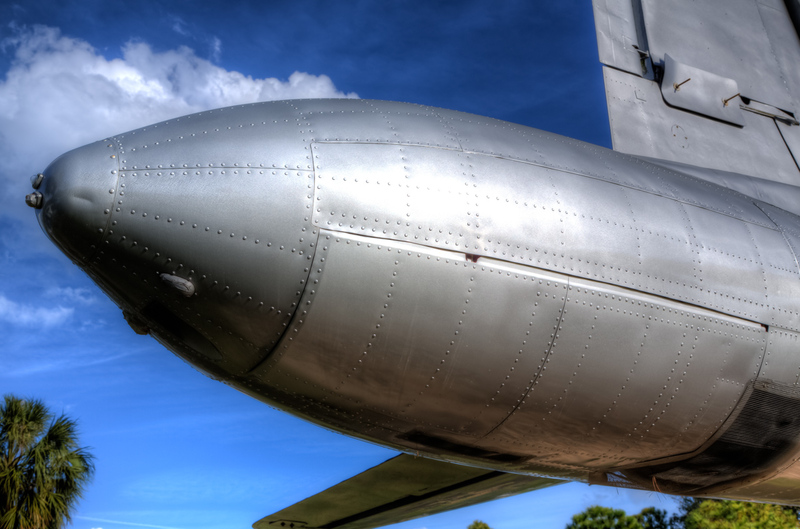 This is the last set of photos of this plane and shows the rear section. I was fascinated by the textures of the metals and rivets of this cone section, whatever it was for. On the wing on the left you can see they added a jet engine to augment the prop engines on the wings. In the background there is a honor detail doing an evening ceremony. 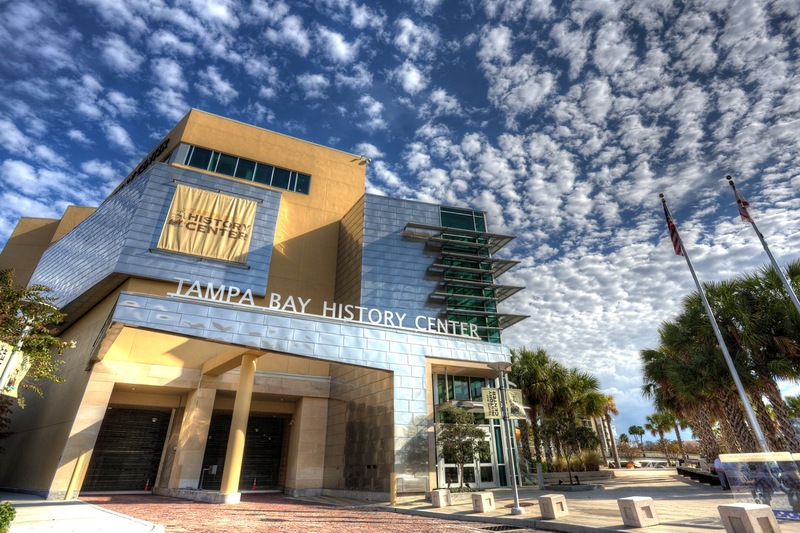 One of my favorite sides of the Tampa History Center was as we were leaving showing the stainless steel panels used here instead of glass. It looks like some sort of high tech battleship skin. 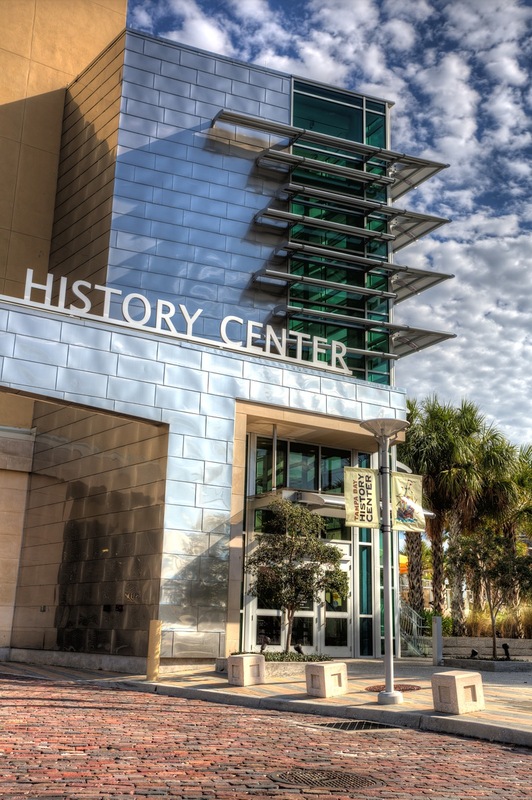 Looking at all this History at the Tampa History Center and walking the River Walk makes you hungry and fortunately they have a wonderful outdoor (and indoor) Columbia Cafe here. They are famous in Ybor City and I have eaten there. 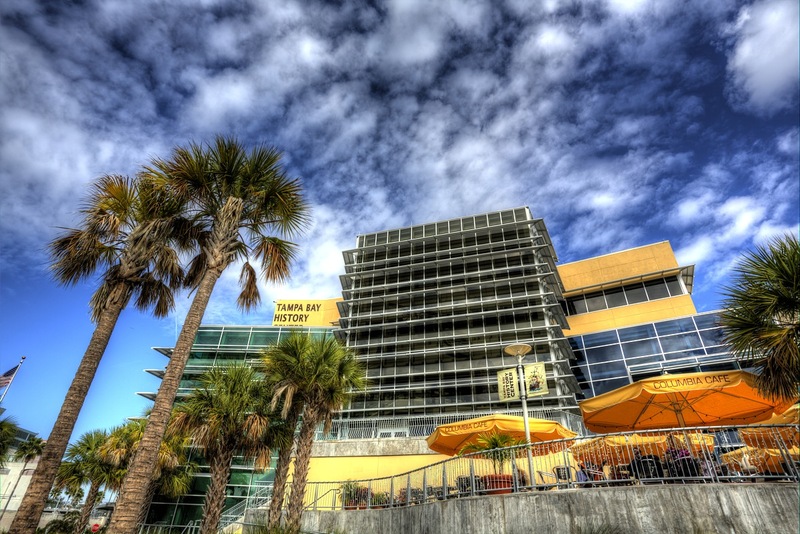 This branch has outdoor dining for lunch with a view over the Riverwalk and River Canal. Looking to the East from the waterfront of the Tampa History Center (Museum) in Tampa, Florida, I can see the wide bridge that goes across the canal cut off of the Hillsborough River to the island on the other side. I am going to have to explore that other side and see what views there are on the bridge both ways too. A powerboat is just crossing under the bridge. There is even a nice sandy beach on the edge of the canal. 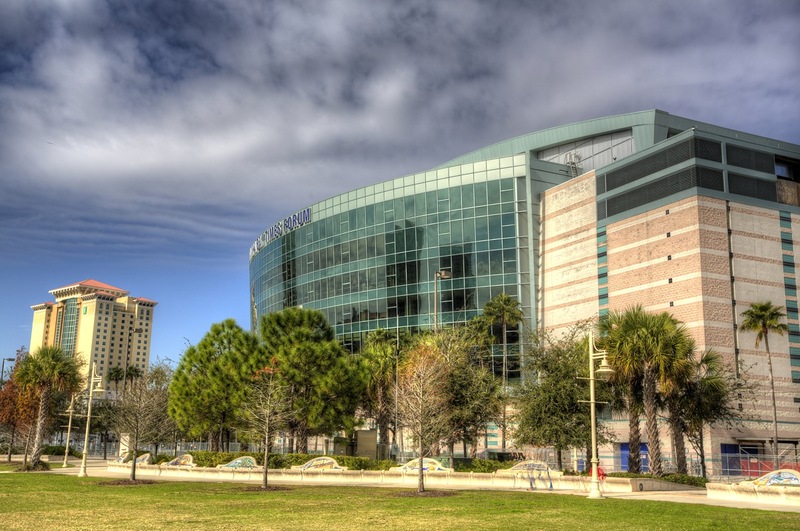 While walking along the Tampa River Walk away from the Tampa History Center (Museum), I took a few shots of the Tampa Bay Times Forum building. It still has some chain link fences up to contain the elephants and tigers for the Ringling Bros. Circus that is inside. 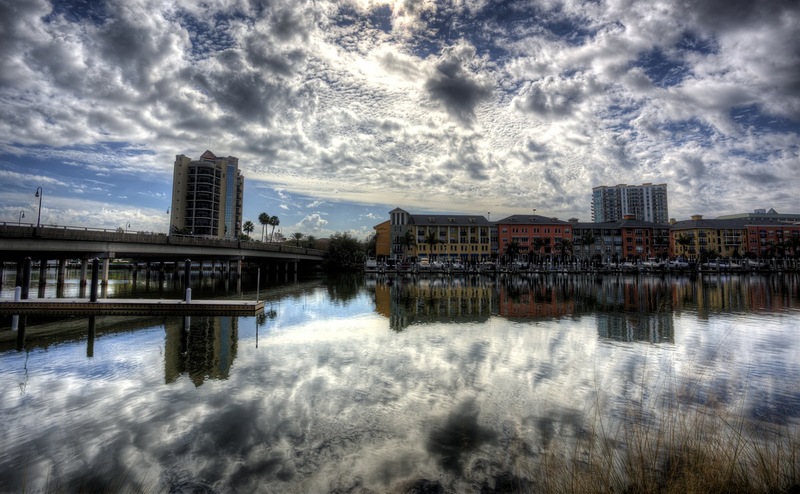 While walking down by the Tampa Museum of History I had to explore by the water with its great reflections of all the clouds. 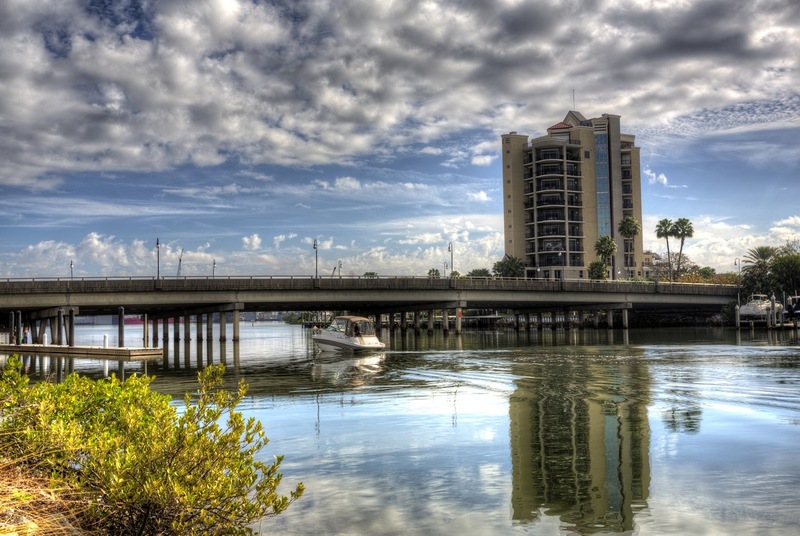 At first I thought this was the Hillsborough River, but actually its a short canal cut off of it for cruise ships and other large ships just to the East. This is a view towards the West in the morning. The marina on the left almost reminds me of Venice. 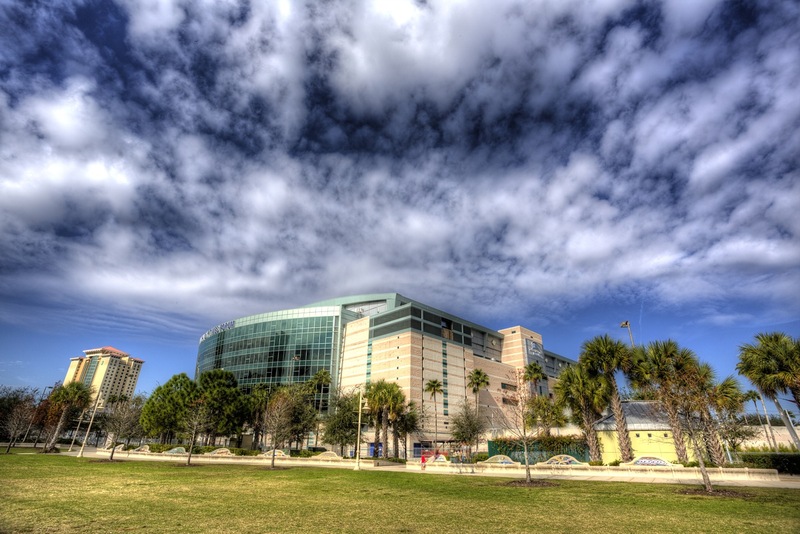 Continuing my walk around the Tampa Museum of History I was exploring the shoreline and water view of the Hillsborough River offshoot. 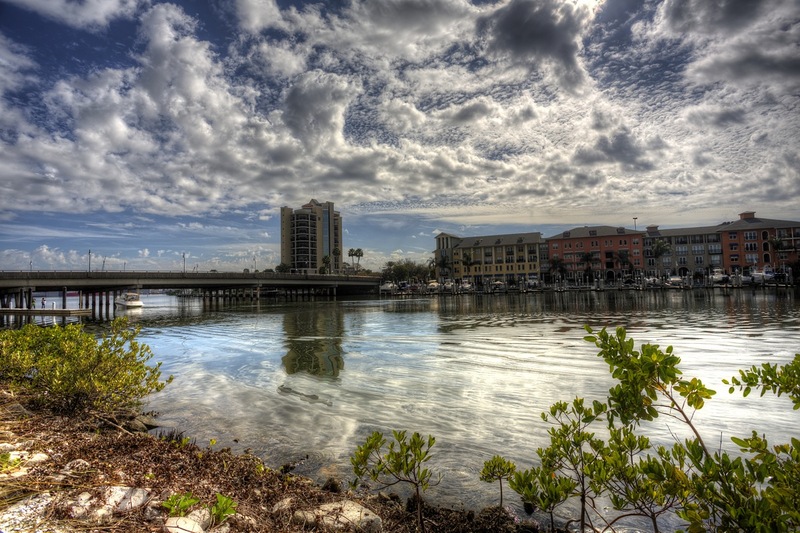 Across the river or canal is a nice marina on the island. There is a bridge running across the water to the island and I will have to check that out soon too. There were still dark lower clouds left over from the morning thunderstorm threat. 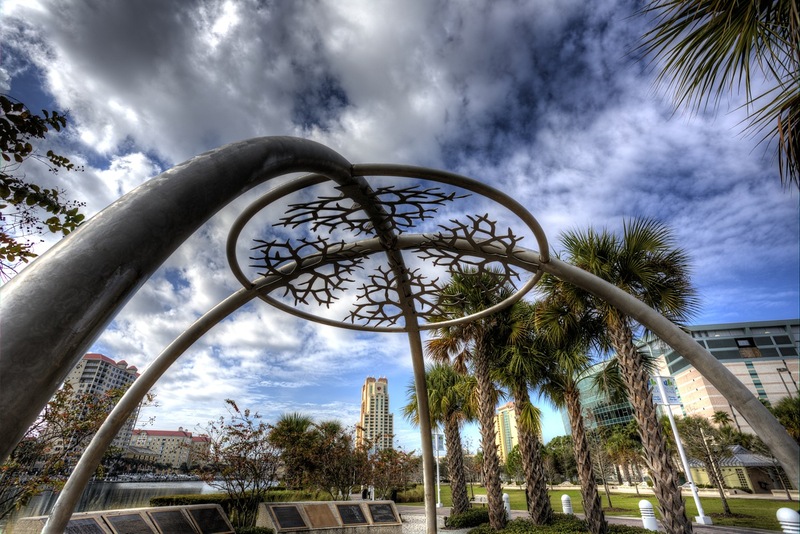 Walking around the Tampa History Museum to get good views of the center, I walked out to the River it is next to and they have a nice park out there with this metal sculpture. 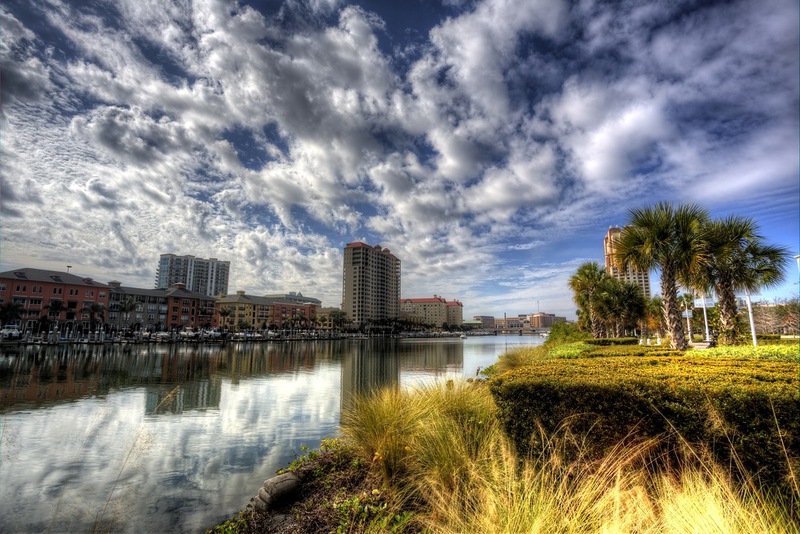 The Hillsborough River is on the left and you can just see the next door Tampa Bay Times Forum. This whole day was supposed to be terrible weather with thunderstorms and 100 % chance of rain, but thankfully, it broke up in the early morning and left beautiful clouds and blue sky instead.